With the Samsung Galaxy S6 edge riding the waves of hype and attention for its glossy, eye-catching looks, you'd be forgiven if the Galaxy Note Edge left your mind for the time being. However, we brought one to MWC 2015 with us, because we were quite eager to compare it with other devices that tick and buzz at the show floor - and that includes the freshly unveiled HTC One M9, which is quite the crowd pleaser too! So let's see how this one compares with the S6 edge's progenitor. The One M9 follows HTC's well established all-metal design line, and it does so in a safe, reliable way. 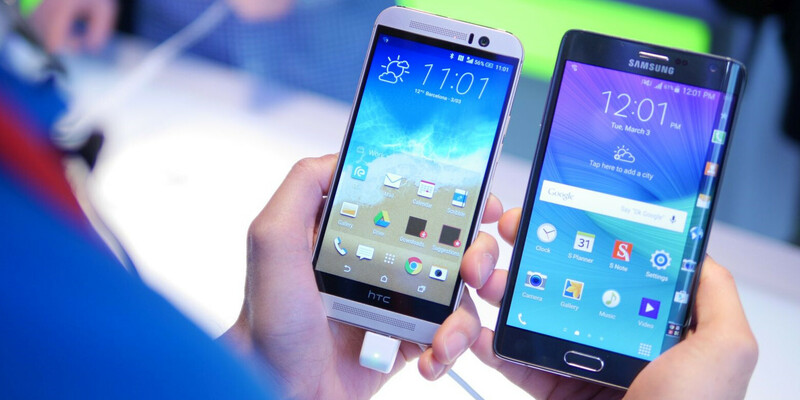 At first sight, it's a bit difficult to tell the M9 and its predecessor apart, but at some point you will surely notice that the M9 looks more like it took the best elements of the HTC One (M7) and One (M8) for itself. With ancestors like these, there's no way the M9 could possibly turn up ugly. Of course, design innovation didn't walk past uninvited. The smartphone has a new metal trim, and a new, slightly grippier finish. Measuring (144.6 x 69.7 x 9.61mm) and weighing in at (157g), it's hardly the slimmest phone out there, but to those of you that prefer their gadgets with a bit of a healthy heft to them, it's surely a godsend. The Galaxy Note Edge is a full-fledged phablet device. At 5.96 x 3.24 x 0.33 inches (151.3 x 82.4 x 8.3 mm) and weighing 174 grams, it's definitely bulkier than the HTC One M9. And unlike the freshly unveiled S6 edge, the Note Edge's 160-pixels wide curved strip of screen serves as a hub for notifications while the handset is in stand-by, and as a tray for app shortcuts when the handset is in use, not to mention that it looks cool and futuristic. Full-on metal it may be not, but the Galaxy Note Edge has a metal frame around the sides, which provides sturdiness while feeling solid when the phone is being held. The Note Edge also features a leather-like soft-touch finish on the back, which has the advantage of not taking your fingerprints hostage. Note-ably, the Samsung Galaxy Note Edge comes with Samsung's trademark stylus, the S Pen. It is primarily meant to be used for taking down notes or sketches, but navigating the UI with it is also possible and convenient. 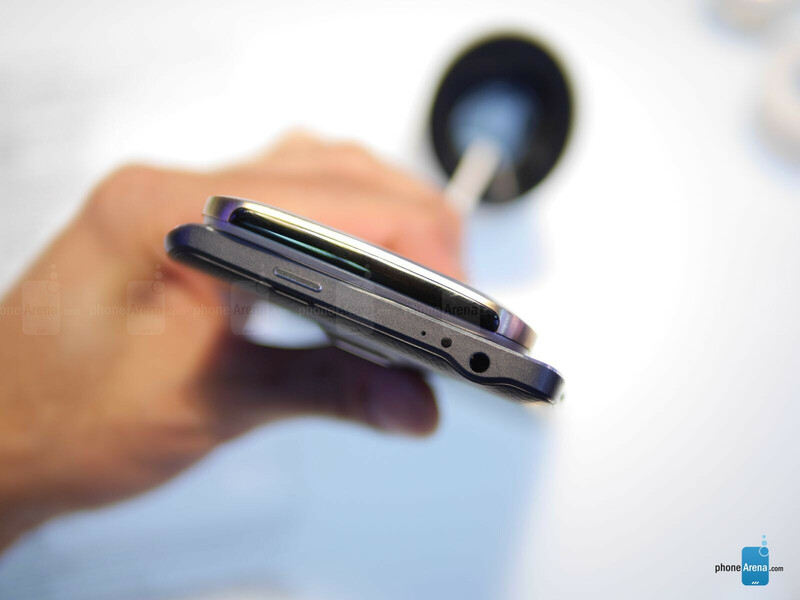 It also has a fingerprint reader built inside its Home button, along with a heart-rate sensor. 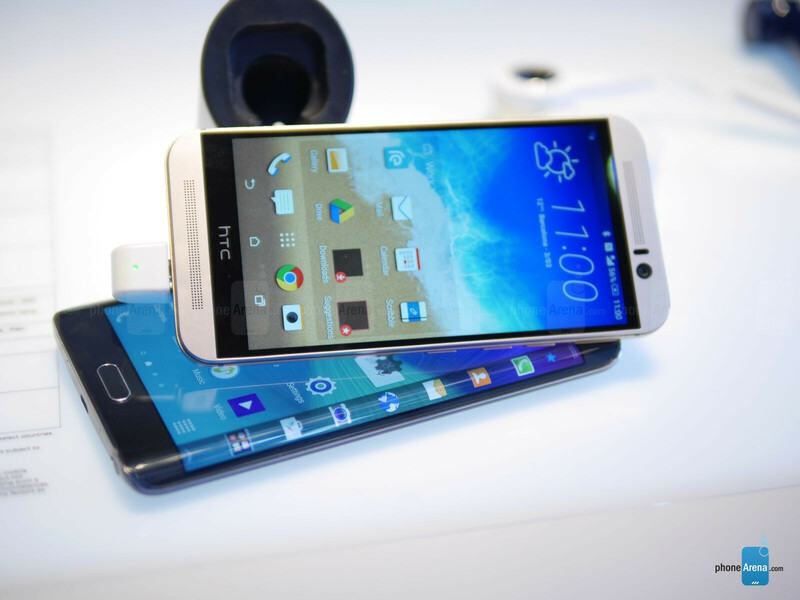 But the HTC One M9 has front-firing speakers. Shunning resolution and pixel density extremes, the HTC One M9 flaunts a perfectly good 5-inch 1080p IPS LCD display with a pixel density of 441 pixels per inch. The resolution is more than effective, with details across the board remaining sharp. We will have to put it through our display test procedures to get an accurate assessment of its properties, but for the most part, things look great on it! HTC is pretty good at tuning those displays for natural, if slightly cold colors, in addition to getting them all nice and bright. From what we've seen, the viewing angles are decent as well, and outdoor visibility is acceptable. Overall, we're left with positive impressions from the M9's display! With a super high-res, Super AMOLED display, the Galaxy Note Edge treats your eyes to beautiful, detailed visuals. It has a 1440 by 2560 resolution resolution which adds up to a pixel density of 525 pixels per inch. The Note Edge's screen provides 5.6 inches of real estate, with those vivid colors typical of the Super AMOLED display. It also has a respectable brightness output of 500 nits, which ensures good outdoor visibility. The HTC One M9 runs Android 5.0 Lollipop topped off with the HTC Sense 7 interface. The visual changes on the surface are subtle – like how the weather-clock widget from HTC now sports a clean, italicized font. For the most part, it's the same modern design language we’ve seen in previous incarnations are present here. In typical Sense fashion, usual staples like HTC BlinkFeed, Zoe, and various Motion Launch gestures are all present once again. But HTC has gone deeper to give users extensive control in how it looks. Specifically, we can select various themes to spiffy the standard look of Sense, and we’re able to modify the color scheme of the UI, the way the icons look, or even rearrange the standard set of Android menu buttons. Android 5.0 Lollipop with TouchWiz running on top is what you'll find on the Galaxy Note Edge. Paired with its still impressive hardware, the Note Edge is totally not a slouch, but its version of TouchWiz does not feel as fast as the new version that comes with the Galaxy S6, nor as fast as Sense on the new HTC flagship. But the Galaxy Note Edge is home to a number of additional features that further complement the S Pen functionality of the phablet. Continuing its partnership with US chipmaker Qualcomm, HTC enlisted its latest creation - the mighty octa-core Snapdragon 810 - for the duty of powering its 2015 flagship. It gave it a roomy 3GB of RAM, and by resisting the urge to stick a power-hungry 1440p display, HTC practically made the M9 a playground for Qualcomm's fiery chip-beast! Just moving around the interface and doing some basic stuff, there’s that constant presence of swiftness and tight response with its operation. In addition, the M9 has 32 gigabytes of expandable internal storage. The Galaxy Note edge is endowed with last year's Snapdragon 805 processor, which is still a very recent, if 32-bit piece of silicon. It also flaunts the respectable 3GB of RAM to better help those productivity and multitasking capabilities. Storage-wise, you get either 32, 64, or 128GB of native storage with the Note Edge, but the latter has a microSD card slot for expansion. The HTC One M9 is devoid of this useful feature. The HTC One M9's whopping 20MP dual-tone flash camera succeeds the HTC One (M8)'s underwhelming 4MP UltraPixel cam, which has been relocated on the front to play second fiddle as the selfie cam. The M9's imaging sensor is made by Toshiba, and it differentiates with square-shaped pixels that are bigger than good ol' rectangular ones and thus have better light-soaking abilities. Now where have we heard that before... oh, well! So far, our experience with the One M9's camera has been promising, but not devoid of problems - particularly in the low light department. While outdoor shots are filled with plenty of sharp visuals and details, low lighting shots are riddled with heavy noise, softer tones, and color fringing. Hopefully, HTC will work out the software that's in charge for that part, although if the imaging sensor is not up to standard, solid code won't help all that much. Good thing the UltraPixel cam on the front can still take a decent, if low-resolution night shot! The Samsung Galaxy Note edge is adorned with a 16MP f/2.2 aperture camera on the back (it's actually the same camera sensor as the Galaxy S6), with optical image stabilization an board, and it's a respectable cameraphone as a whole. And at the front, the Note Edge carries a 3.7MP camera, which lands decent selfies. 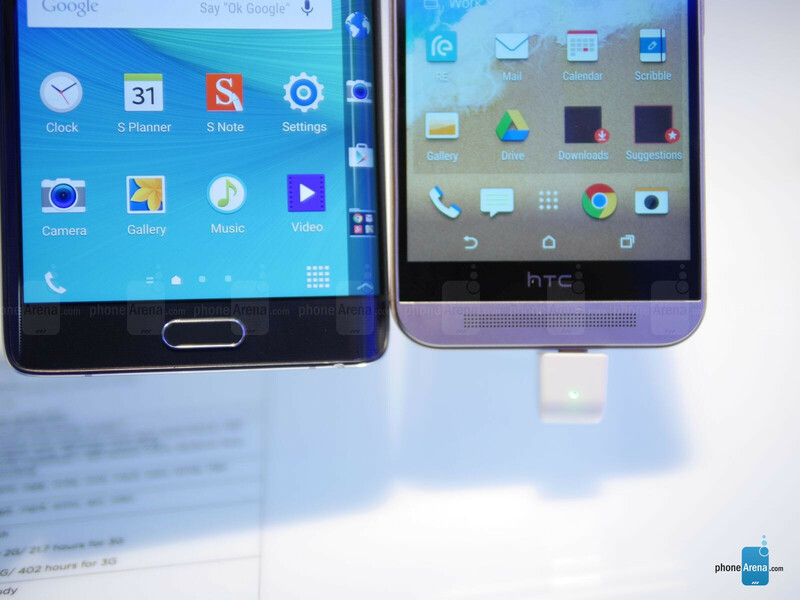 The HTC One M9 begins sales in late March, while the Galaxy Note Edge is already on the market, though in somewhat limited qualities. Both devices are premium-tier, expensive propositions, and are unique enough to make choosing between them very easy (if you prefer one's look and features over the other), or very hard (if you like both too much, which is quite understandable!). However, the productivity-on-the-go oriented among you will surely choose the Note Edge, because it's a full-fledged phablet with unmatched stylus options and meaningful functionality to the curved part of its display. Hey Samsung and HTC the under dogs are catching up. I've set aside my Note 4 for the Mate 7, yeah be worried. Samsung, Apple, HTC.... the CUSTOMER decides who your competition is, not you. Ask RIM(Blackberry), ask K-Mart, ask Sears,... The list goes on. i bet they're quaking in their boots from the might of the Mate 7. Decent phone, but daft to think it will trouble Samsung and HTC.